Through Children's Ministry we try to impart the faith to the children and youth of the church. We also try to build community and inclusion of children in worship as well as in the church community. We impart the faith to our children mostly through weekly Sunday School sessions, as well as children's sermons at church. All Saints Day/Día de los Muertos Craft activities and special Children’s Sermon. All inclusive Christmas Pageant: a simple all participatory pageant in which children and all the church put on costumes and are directed through a simple no practice pageant with lots of props, dress up and singing, bringing the Christmas story to life for kids. Holy Week activity booklets and Easter activity booklets and crayons to link children to the happenings of Holy Week and Easter. Raffle of Bird Houses between Bethel Church and University Church raised $310 to benefit Habitat for Humanity. Runs September through December meeting twice a month. Co-effort between youth of First Lutheran Church in Palo Alto and University Lutheran. Attendance of about youth from University Lutheran and First Lutheran. Led by parents, pastors, and teachers. Using Re-form curriculum that brings Old Testament and New Testament stories alive for today’s youth. Ages range from 10-14years old. From this youth bible study group, children move to confirmation, again with First Lutheran and University Lutheran. All are welcome at Uni Lu, including you and your child. We invite you to join us any time! 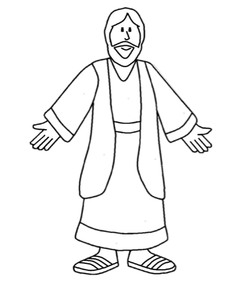 Click to download your own Flat Jesus and let us know where you're headed! We took Flat Jesus with us on our travels in Summer 2014. Flat Jesus reminds us of God's unconditional love, no matter where life takes us.